Hand Painted Cookie Platter. 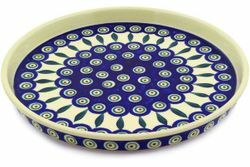 This beautiful polish pottery platter is a must have! Generous stoneware platter is perfectly sized to hold your Christmas cookies in grand style! Beautifully crafted of chip-resistant stoneware, this platter can be placed in the dishwasher and microwave, and is also lead free.